You’re probably asking yourself why I’m reviewing a cartoon. Well this cartoon is strangely unique and purely amazing! Steven Universe follows the adventures and characters of Mainly 4 crystal gems called Garnet , Amethyst , Pearl and last but not least Steven. Though this series they uncover the mystery of gem’s and have fun adventures that are very interesting with music that is fantastic! 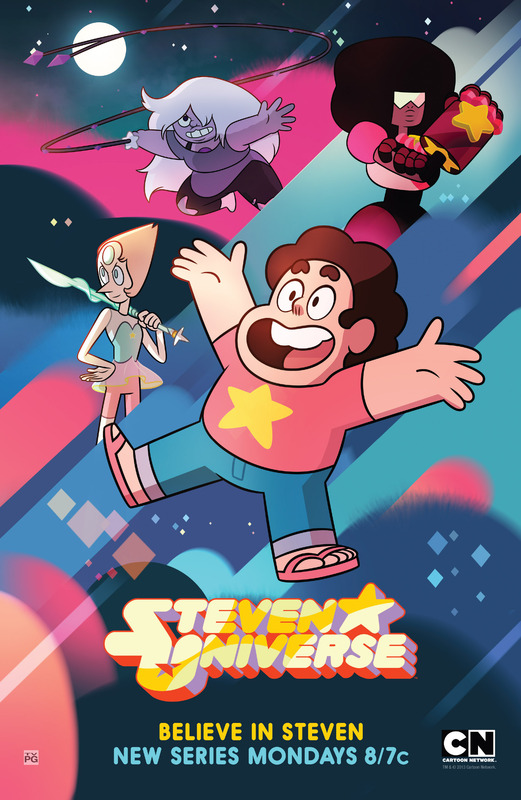 Steven universe is one of those cartoons that mix mystery , adventure and just make you feel good about being yourself. Not to mention This is one of only two cartoons that make me bust out laughing with funny situations and extremely expressive voice acting. This cartoon is really amazing in terms of how it make you feel good about being yourself. Steven is a half human half gem and inherits his mother’s gem. While being half human and not being as old as the other gems , he always finds himself not knowing how to use his gem which leads to him not feeling as useful as the others. What is special is he always finds a way to make it work , and always sees the beauty of the situation no matter how hard or how difficult it seems, he has faith he can save day. The art style is just gorgeous with it feeling very imaginative and light colors, with music that is subtle at times but is perfect for the situations imposed. This show also has a plot that is very interesting with where the gems originated and fight scenes that involve fusions of gems and the various lore of monsters and corrupted gems. This animation is wonderful and if you’re in the mood for a laugh , good art work to look at , or just want to feel good about being yourself this show is definitely for you. Here is the intro which gives off an automatic feel for how sweet the show is !